Urban innovation can mean or refer to many things and there's no shortage of ideas about how to make cities better or more sustainable. As the theory and more deterministic 'forecasting' goes, cities must get better if they are to foster and sustain the types of globalised knowledge and creative economies that will underwrite the future. However, there can be both disagreement and diversity in how to understand what better and development actually mean in and for urban environments. Two recent Australian publications reveal some of that diversity by presenting a series of case studies in community engagement, site specificity and place. Edited by Elaine Lally, Ien Ang and Kay Anderson, The Art of Engagement: Culture, Collaboration and Innovation presents results and reflections on C3West, a project that formulated unique arts-business-community collaborations in Western Sydney. 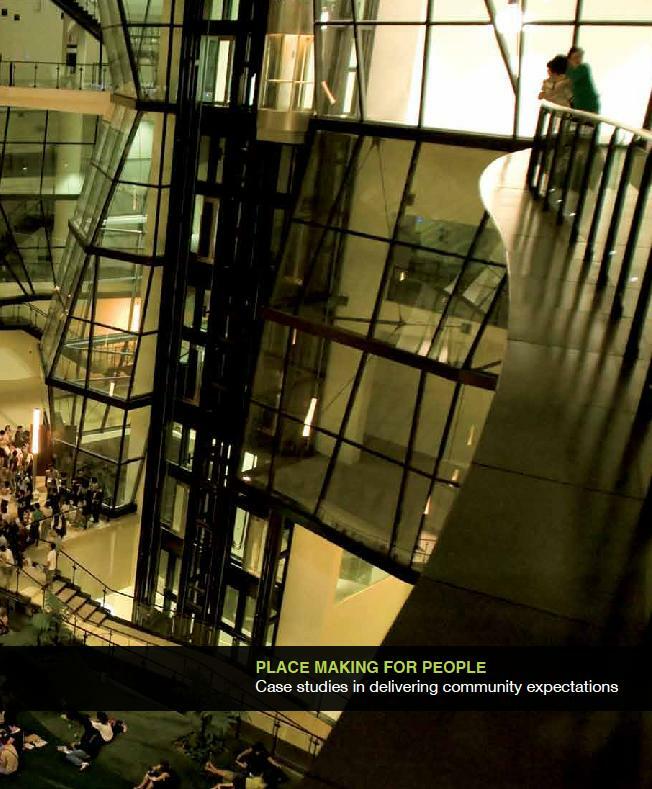 Place Making for People: Case studies in delivering community expectations, compiled by the Place Leaders Association, presents major urban developments in Australia and overseas that have sought to recast planning and community engagement paradigms. What these publications reveal is a swarm of thinking and problem solving tackling the challenges of cultural development and place making. Where Place Making for People predicts a transition from car-based suburbia to urban work/lifestyle hubs in the decades to come, The Art of Engagement demonstrates that dynamic cross-sectoral exchanges are still possible between urban cultural institutions and suburban communities. For the contributors to The Art of Engagement and the architects of C3West, these exchanges have activated collaborative potential in the Western Sydney region. The projects featured in The Art of Engagement engage with notions of site specificity, public space and place shaping, and highlight some aspects of what can happen ‘on the ground’ when experimenting with new ways of doing things. However, there are sectoral biases and professional imperatives – perhaps baggage in some instances - that ripple through the case studies in both publications. Where in the artworld, it might be feasible to ask “how can art involving the community really be considered art?”, in placemaking, it is more feasible to ask “how can planning without involving the community really be considered planning?”. Hence Place Making for People foregrounds an awareness that community expectations need to be met. However, there are, as both publications reveal, potential crises of collaboration – how much is enough, who really decides, what about conflict, what about power and politics. Both books are instructive on these questions and perhaps their meeting point lies in a broadened appreciation of the significance of cultural planning as a platform for capturing shared values and facilitating the aspirations of communities for their built environments as living, productive and creative places. Interestingly, cultural planning and cultural development slips out of urban development considerations and is often subsumed by considerations of physical form and urban design, such as public art. Creative places and innovative projects, it seems, can be resolved through innovations in engagement and collaboration; this is ultimately a message of both publications. Place Making for People features case studies of infill development and regeneration including Brisbane’s South Bank and Fitzgibbon Chase, Darwin’s Waterfront, Newcastle’s Honeysuckle Promenade, and Adelaide’s Lochiel Park Green Village. These projects all demonstrate how community engagement has informed the evolution of these projects and precincts. Change is rarely, if ever, easily won. However, some projects demonstrate the importance of recognising and responding to opposition, while also playing a positive role in community development. The ULDA’s Fitzgibbon Chase is a case in point with its commitment to incubating cultural engagement through public art within the emerging community. Art and culture are heavily implicated in these projects even if not explicitly stated: the cultural dimensions of placemaking include lifestyle, leisure, heritage, design, community engagement and public art. The case studies recognise that communities cannot be masterplanned. Consequently, there are cues here for a more culturally responsive and integrated approach to planning and placemaking that extends beyond the drafting of plans into the facilitation of socio-cultural networks, relationships and dynamics. This idea of the ‘relational’ is carried through the four projects recounted in The Art of Engagement with its emphasis of ‘arts-led collaboration and engagement’. In the complex cultural geography of Western Sydney, the C3West projects took hold and shape in recognition that the territory they were charting was new. Ash Keating worked with SITA Environmental Solutions and local artists and students in addressing environmental concerns, Craig Walsh was immersed in the prowess of Penrith Panthers and the fervour of their fans, Jeanne van Heeswijk worked with Veolia Environmental Services to collect stories of personal relationships with waste, and Sylvie Blocher and Campement Urbain worked with the Penrith Panthers and Penrith City Council to develop a multimedia vision for Penrith’s future. All the artists share a commitment to process-based participatory cultural production and communicative exchange. For most of these projects, which are principally site/context specific rather than place-based, a learning experience negotiating multiple stakeholders and thresholds is embedded – mediating business with specific community relations needs and community members as co-producers and collaborators. The resulting projects – artworks, conversations, exhibitions, performances – all provided insights into community values and cultural identities in Western Sydney. The engagement processes reveal a slippery and fluid artistic agency. Put simply, artists can get away with things that others cannot. A planner, for example, probably can’t pitch the kind of visioning process realised by Blocher and Campement Urbain. And this tells us something about how participation is constrained in planning and development. A recent roundtable in Berlin sought to explore the role of artists and designers in shaping new kinds of human relations in public matters, using the term ‘relational participation’ to indicate a merging of participatory practices and relational aesthetics. This is an idea that resonates with the processes used in the C3West projects. Ultimately, it facilitates a public that is active and more involved in contemporary issues and urban affairs. If the question is about how that public is composed, then the C3West case studies provide some indications because there is recognition of the limits of communicative rationality and consensus. While Place Making for People foregrounds community expectations in its cases studies, Anderson, Ang and Lally conclude that community engagement is a resource and an opportunity. There is potential for co-creation and user generation as integral to cultural experience. Both publications have raised points about what community, engagement and culture mean in relation to change. One question that perhaps warrants asking is "what could happen if the people responsible for C3West and similar urban cultural projects pooled ideas and intelligence with the Place Leaders Association?" That type of immersive interdisciplinary negotiation and learning will be foundational to creating and realising a sustainable future for our cities.